Mill Hill School is London’s leading co-educational day and boarding school for 13 to 18 year olds, and forms part of the Mill Hill School Foundation which also includes a preparatory school, a pre-prep and our recently launched International School. Located in 120 acres of beautiful parkland just ten miles to the north of London, Mill Hill School has an international reputation for excellence which has been built over more than two centuries since its foundation in 1807. The Mount, Mill Hill International School, is located within its own newly refurbished campus just a short walk from the main Mill Hill School site, and its pupils are members of the wider Mill Hill School community. 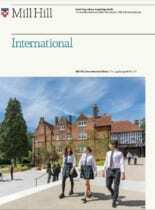 With four dedicated boarding houses on the Mill Hill School site, International School pupils have full use of the Senior School’s excellent facilities including an indoor heated swimming pool, sports hall, library, theatre and music department. We aim to have a truly international school and welcome pupils from all over the world, with a good balance of nationalities.